People hear the word “choir” and most often think of voices, but Trinity Church in Menlo Park has a choir of a different sort, a dozen or so people who are part of a handbell choir called Trinity Ringers. The group will be accompanying a string quartet and vocal choir at the 6:00 pm service this Christmas Eve. According to Wikipedia, handbells were brought to the United States from England in the early 20th century. Handbell choirs play recognizable music with melodies and harmony, arranged specifically for that instrument. 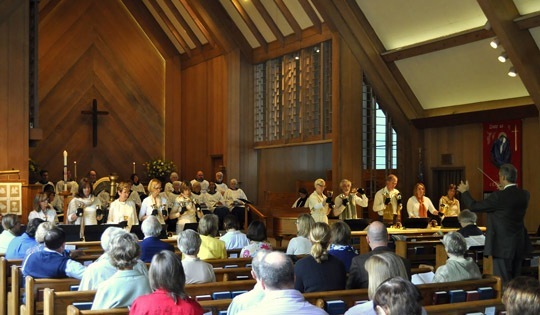 Trinity’s handbell choir is celebrating its 15th anniversary this year. It was started by parishioner Mary Pless, who had grown up in Texas, where handbell choirs are more common, as is true in other parts of the South.